Christmas came early for Lindenwood VAC thru a very generous donation of three Physio Control / Meditronic LifePak CR Plus Automatic External Defibrillators from our friends at Rescue Training International. The donation of these defibrillators will help Lindenwood VAC better serve our communities. Again, a HUGE thank you to Kevin Mahoney and Sean Graves from Rescue Training International. Please check them out for if you are interested in EMS / CPR training!! Early last year our website crashed and we lost all our content. We were able to find some content from our old page and we were able to recreate some pages. This will take some time… but we will be back.. Till then visit us on Facebook – CLICK THE LINK BELOW! OZONE PARK (NY) – Sometime in the early morning hours overnight, vandals painted graffiti on one of two ambulances owned by Lindenwood Community Volunteer Ambulance Corps (VAC), a community based volunteer ambulance service serving the 40,000 residents of the Southwest Queens communities of Lindenwood (part of Howard Beach), Ozone Park and South Ozone Park . The damage was discovered by a member of the corps early Sunday morning. “The dollar of spray paint will now result in thousands in repairs and a vehicle being out of service for weeks.” said Chief Christopher DeLuca of the ambulance service. “and we don’t know if this will be covered by our insurance policy” he continued. The ambulance service is no stranger to acts of vandalism on its property. Lindenwood VAC’s headquarters, once the home of famed beatnik author Jack Kerouac had a memorial placed in the author’s honor stolen and more recently its other ambulance was also hit with graffiti however the vandals used markers its was easily cleaned. NYPD is currently investigating the crime. Lindenwood VAC is currently trying to get surveillance footage from a nearby business hoping it will yield some evidence to help police catch the individual responsible. 07/05/2007 – Lindenwood VAC goes to Times Square!!! Lindenwood VAC will appear as part of a new Dell Small Business Computer ad campaign. 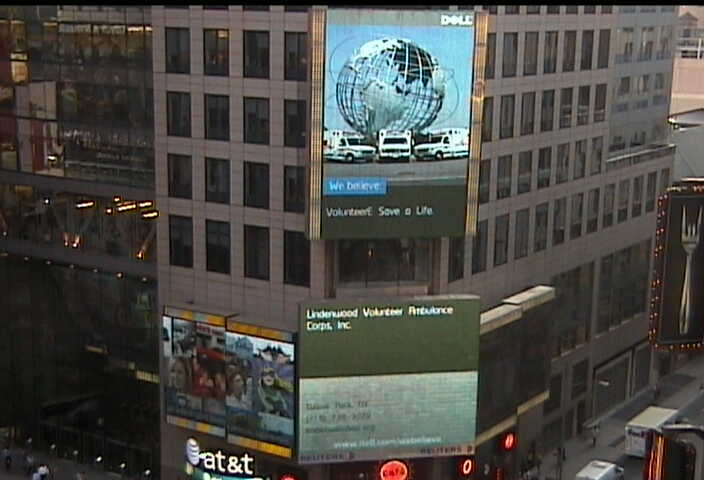 Dell will rotate Lindenwood VAC advertisement along with other small businesses on a billboard in NYC’s Times Square for two days, Monday, July 09, 2007 and Tuesday, July 10, 2007. 12/16/01 – Christmas came early to Lindenwood VAC in the form of a fully equipped 1994 ambulance from Brighton Volunteer Ambulance Corp of Brighton, New York, more than 500 miles away. Click on the link to the Queens Chronicle to read more about this event. 12/7/2001 – The Independent Biker’s Toys for Tots Run was a huge success. An estimated 15,000 bikers participated and we no injuries were reported. Lindenwood VAC would like to thank Broad Channel VFD, Glendale VAC, Jamaica Estates VAC, West Hamilton Beach VFD, and Woodhaven-Richmond Hill VAC for assisting in the EMS coverage. 3/22/2001 – LVAC received final written confirmation from NYC REMAC that LVAC is authorized to allow Paramedics riding on our BLS ambulances to perform Advanced Airway techniques. LVAC is now in the process of selecting a vendor and purchasing the equipment necessary to provide this function.